This Mediterranean design is an attention stealer. While the foyer displays a niche, a cathedral ceiling highlights the great room. The fireplace lies between built-ins, and columns define the dining room. 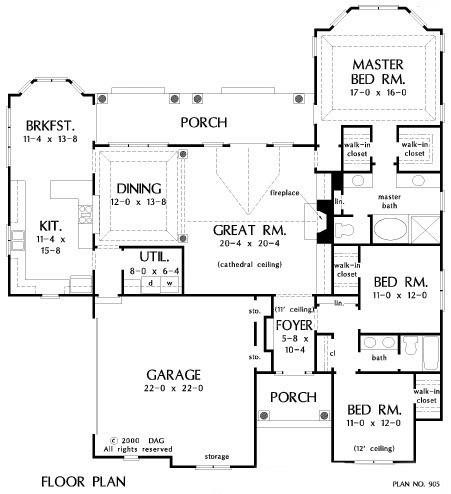 The kitchen has a convenient pass-thru, and the master suite features a tray ceiling, bay window and patio access. 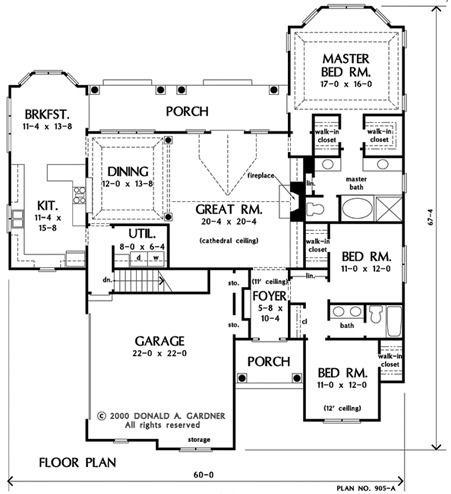 House Dimensions: 60' 0" x 63' 8"
Great Room: 20' 4" x 20' 4"
Master Bedroom: 17' 0" x 16' 0"
Master Bedroom (Tray): 17' 0" x 16' 0" x 10' 6"
Bedroom #2 (Flat): 11' 0" x 12' 0" x 12' 2"
Porch - Front : 10' 4" x 6' 6" x 0' 0"
Porch - Rear : 30' 4" x 7' 0" x 0' 0"
Foyer (Flat): 5' 8" x 10' 4" x 11' 0"
Dining Room (Tray): 12' 0" x 13' 8" x 10' 6"
Great Room (Cathedral): 20' 4" x 20' 4" x 17' 0"
Kitchen : 11' 4" x 15' 8" x 9' 0"
Breakfast Room : 11' 4" x 13' 8" x 9' 0"
Garage Storage : 2' 0" x 10' 4" x 0' 0"